ANZAC Day 2017 will be held on Saturday April 29 from 6:00 pm until 10:00 pm. This important annual commemorative event will be held at the Scandinavian Cultural Centre, 764 Erin in Winnipeg, and all are invited to attend. The official ceremony will start promptly at 6:00 pm, and include greetings, laying of wreaths, last post, and singing of our national anthems. 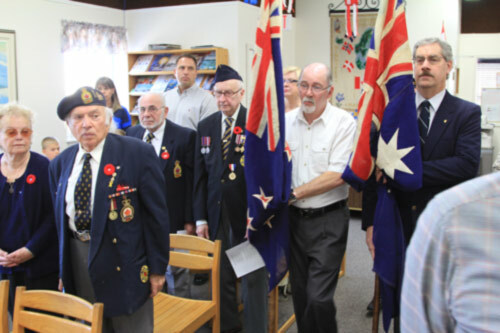 This will be followed by a POTLUCK dinner, a social gathering that will include camaraderie and conversation, and a formal presentation titled “Canadians at Gallipoli”. If you are planning on attending the event and staying for the potluck dinner, we ask that you bring a main OR veggie dish OR salad with enough for yourselves and a bit extra for our veterans. LCol (ret’d) Art Brown RCAF from the Memory Project who will deliver the formal presentation. ANZAC Day is a national day of remembrance in Australia and New Zealand. It was originally commemorated by both countries on April 25 every year to honour the members of the Australian and New Zealand Army Corps (ANZAC) who fought at Gallipoli in the Ottoman Empire during World War I. It now more broadly commemorates all those who served and died in military operations for their countries. The Battle of Gallipoli amounted to an enormous loss for Aussies and Kiwis who fought as ANZACs – Australian and New Zealand Army Corps – under British command. There was also a Canadian component to that battle, with many Newfoundlanders fighting at Gallipoli. A significant occasion on downunder calendars, we are proud to keep the tradition alive here in Winnipeg by marking ANZAC Day with reverence, remembrance and friendship. For more information about the Alumni Event, Australian passport interviews, and our ANZAC Day event, please contact info@downunderclub.mb.ca . April 25th, 2015, marked the 100th anniversary of Anzac Day, to the day in fact, so the DUCW decided to put together a very special version of our annual event at Winnipeg’s Aviation Museum. Club members joined special guests, including military and state representatives. Explore some of the special 100 centenary efforts made in our homelands back in 2015 through some notable websites and apps. Public broadcasters have created impressive interactive resources which bring alive the story from 100 years ago. Some of our original members have connections with the military so we have a splendid turnout in uniform, and we invite other veterans. We generally attract a number of military folks to this ceremony. There are a few formalities followed by a potluck dinner and a good visit. ANZAC Day is a national day of remembrance in Australia and New Zealand, originally commemorated by both countries on 25 April every year to honour the members of the Australian and New Zealand Army Corps (ANZAC) who fought at Gallipoli in the Ottoman Empire during World War I. It now more broadly commemorates all those who served and died in military operations for their countries. 2015 marks the 100th anniversary of the Battle of Gallipoli, and as such, is a significant event for Australians, New Zealanders and Canadians. We look forward to seeing our club members, invited guests and the general public at our special event at the Western Canadian Aviation Museum in Winnipeg. If you would like to participate in the planning of this event, please contact us through the website CONTACT page. The first Allied troops landed in Turkey’s Gallipoli peninsula on April 25, 1915 when the Australian and New Zealand Army Corps (ANZAC) and British forces came ashore. It would be the start of months of trench fighting that soon made it clear an Allied victory there would be much harder than thought. Members of The Newfoundland Regiment had arrived hoping for action and excitement but they were soon disappointed. They spent the first months digging trenches and keeping long night watches, spending time on the front line learning trench warfare techniques from the ANZAC and British forces that had been fighting there for months.